Outstanding in Their Field presents 15 women with very little in common except that they are directors at top Fortune 1000 public company boards. Subtitled, How Women Corporate Directors Succeed, the book is the product of two years’ research and interviews with women corporate directors who are willing to speak -– on the record -– about how they achieved this impressive goal. The Introduction describes governance, how boards of directors are changing, and how there has been a tremendous increase in opportunities for women to reach leadership positions on corporate boards in the modern economic marketplace. 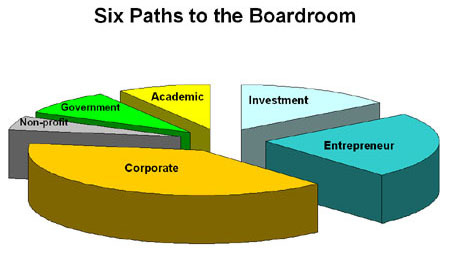 Six sections describe each of the primary paths into the boardroom. The stories of fifteen women, two to three for each path into the boardroom, document their early upbringing, their education, their starts and stops and changes in their unique careers. These stories tell of the diverse experiences, competencies, and capabilities that today’s women candidates bring to the boardroom. The introduction to each path summarizes the research drawn from corporate proxy statements, biographies, and the collective experience of all 114 women directors who served on top corporate boards (Fortune 1000 firms) located in California during the study period (2006-2007). What does the data tell us about corporate boards of directors in California? How do boards find talented and competent women leaders from around the globe? What does a close examination of all of the women directors tell us about trends and prospects for the future? 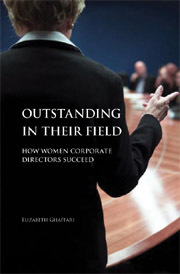 Outstanding in Their Field provides refreshing insight into the wide variety of opportunities that exist for contemporary businesswomen to rise to leadership along any one of six prominent "paths into the boardroom" -- nonprofit, government, academic, entrepreneurship, investment, and corporate. Which path, today, provides the best opportunities for success? Which paths belong among the “myths” and “urban legends” that women and women on board advocates propagate? Each woman tells her own story about how she followed her chosen career path to a unique position of leadership. She tells us what she considers to be the important "lessons she learned" along the way, what she views as the important contributors to her progress, and what she recommends for those who might follow in her footsteps. The director profiles represent unduplicated stories of origins, family, life choices, and roads taken as well as roads-not-taken. No two stories present the same perspective. And yet, these women have some things in common: some "life lessons" that can be handed onward to the next generation of women who might aspire to leadership. What did they do that is different from their peers? How did these women become leaders? The lessons from this book are equally applicable to men and to women who aspire to become a member of a board of directors. The focus is on these successful women in leadership because they offer an interesting, different perspective -- one which contrasts sharply with the headlines screaming from today’s newspapers. There has been a dramatic increase in the number of women in leadership at public companies, as well as in government, in academia, in entrepreneurship, and on corporate boards. The opportunities are many for those women who are ready, willing, and able to prepare themselves to serve in this most important capacity. Books written about women in leadership or on corporate boards tend to present the view that the "glass is half empty" (the negative scenario). The historic focus has been on the belief that women cannot or will not lead --- unless of course somebody else does something, first. The author found women who can and do lead at the very top rung of leadership: in the corporate boardroom. Outstanding in Their Field meets the needs of the women who see the world through a positive outlook, recognizing that "the glass might possibly be brimming" with talent. In today’s marketplace, the demand is for: (1) exemplary role models, (2) real biographical material (rather than "power puff pieces"), (3) interviews with women willing to provide their perspectives on the issue, and (4) an opportunity to hear the women say "How I did it" so that the reader can select what she wants to apply in her own life. The book does not deny the reality that progress will take time and be hard-earned. It asks the women in leadership what they believe women themselves can and must do to prepare themselves if we want to see many more women like them in positions of influence and authority, especially at corporate boards of directors. If women across the talent spectrum only hear about "old myths" and "ancient battles" for gender equity and justice, then our leadership candidates will miss the message that this new research, these new interviews, these exemplary role models, and their business case studies have to offer. Today, women have truly unique and different perspectives on such well-worn truisms as: networking, mentoring, and the joys and satisfaction of leadership. This is not our mothers' guide to leadership. It is for us, here, and now.